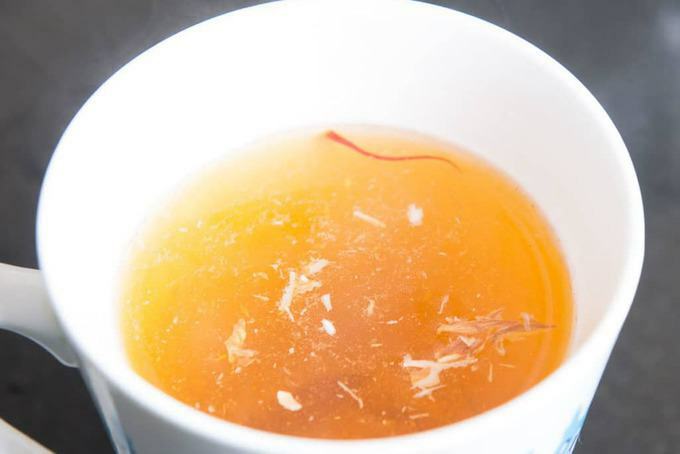 Kahwa is a Kashmiri tea flavoured with cinnamon, cardamom and saffron. It is a great drink to sip on cold winter days but can be had through out the year. 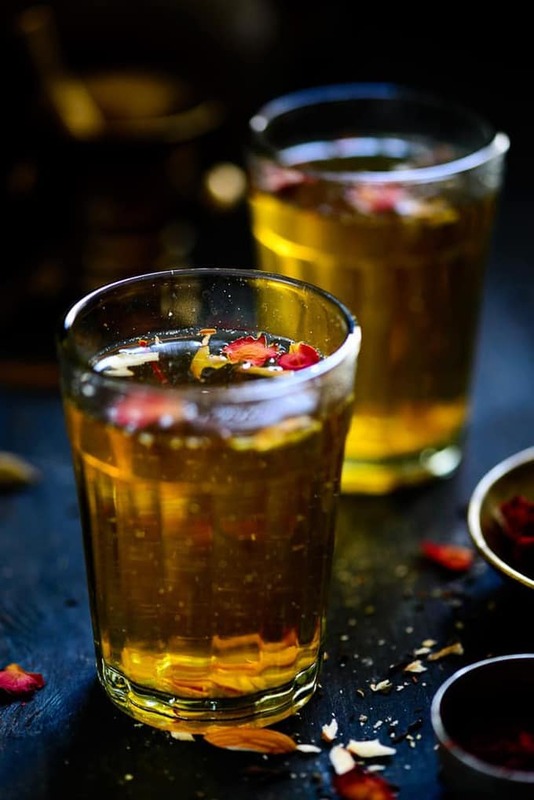 Here is how to make Kashmiri Kahwa Tea Recipe at home (Step by Step). Kashmiri cuisine is royal, flavorful and scrumptious. It marks its own significance as naturally sourced spices are used for preparing it. Just like the delicacies, the Kashmiri beverages are quintessentially complex yet interestingly simple. Kahwa is a popular beverage and people through out Kashmir keep sipping on to this to keep their body warm during the severe cold months. Kashmiri Kahwa is a traditional Kashmiri tea flavoured with cardamom and infused with cloves, cinnamon and saffron. It was traditionally prepared in a brass kettle known as samovar. Kahwa tea is generally served with a sprinkling of chopped dry fruits like almonds, cherry pistachios or cashew nuts, almonds being the most popular. Kashmiri Kahwa Tea has many health benefits and is a great option to include in our lifestyle. Here are some of the question that many of you asked about Kashmiri Kahwa and I am happy to share whatever I know. Do add on if you know something interesting about this healthy drink. 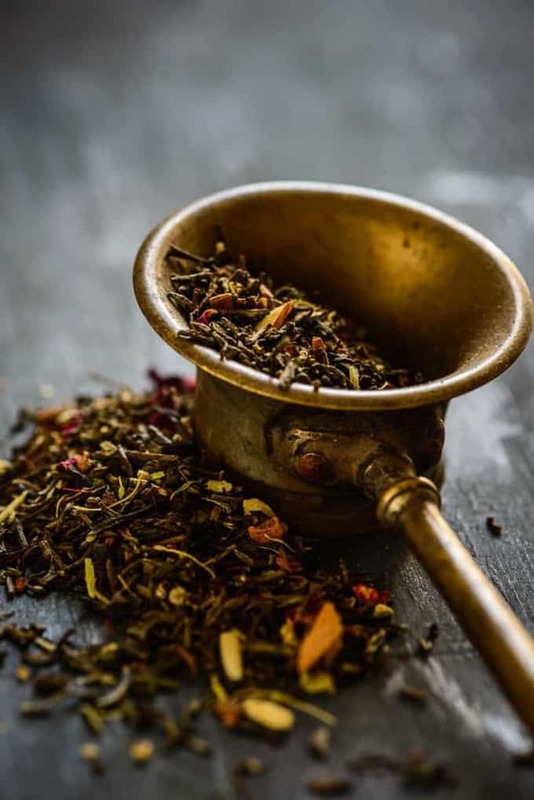 What are the health benefits of Kashmiri Kahwa? It is usually served after meals in any Kashmiri household as it aids in digestion and burns the fat. It reduces the risk of heart disease by keeping the deposition of cholesterol in check. Saffron used in kahwa is rich in vitamin B12 and aids in immunity building and keeping the body’s defence mechanism in check. Since it is rich in anti oxidants, it is a great stress buster and it also helps to improve metabolism. It is a great remedy for cold and cough and improves skin health. How to make Kahwa at home? Making it at home is fairly easy. The only thing you need to source is the special tea. I usually order it through amazon but you can check with your local stores. 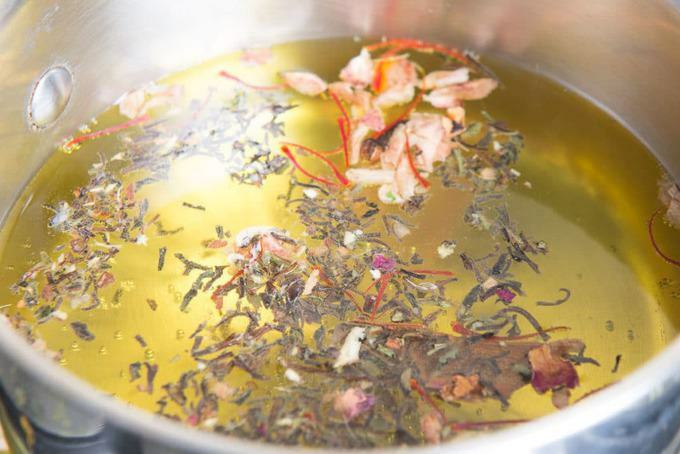 Other than that it uses the basic ingredients like whole spices and saffron. Check out the step by step recipe below to see how to make it at home. The only thing to keep in mind while making Kahwa is that you should not add leaves while the heat is on. 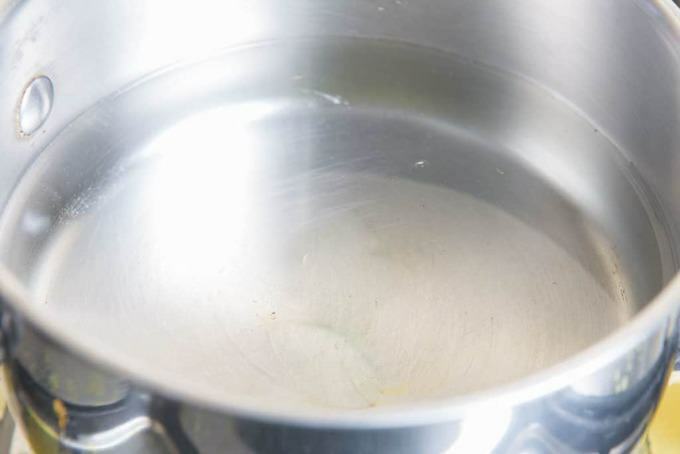 Boil the water with spices and saffron and then switch off the heat. Let the water rest for a few seconds and then add the tea leaves. It helps to retain the nutritions in the tea intact and do not hamper with the taste. Strain the tea after one minute of infusing otherwise it will become bitter. Where to buy Kahwa Tea Leaves from? Kashmiri Kahwa Tea is made with fine green tea combined with various spices, nuts and saffron. You can buy the tea online here. I like to try out different brands and this time I tried this one and loved it. You can give it a try to. If you live in the US, this brands sounds promising. I am sure you must have liked reading about Kashmiri Kahwa, right? Why don’t you jot down its interesting recipe and make it someday? 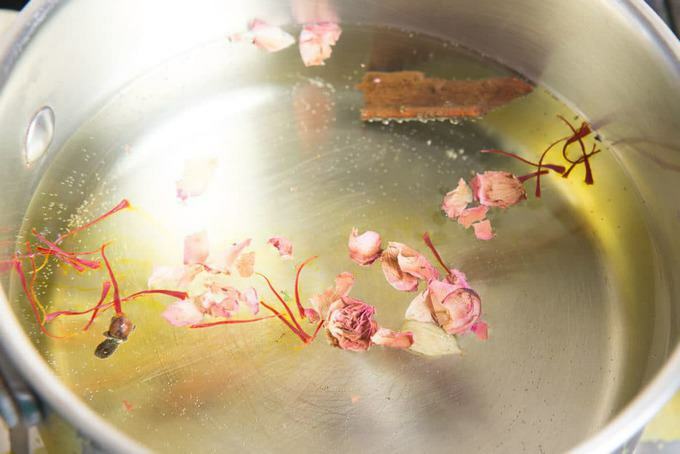 Add saffron, cinnamon, cloves, dried rose petals and cardamom in water and let it simmer for 3-4 minutes. Switch off the heat and add green tea in the water. Let the tea steep for a minute. Strain the tea in 2 cups. Add almond slivers and a few strands of saffron. Add honey if you like your kahwa slightly sweet. Serve hot. 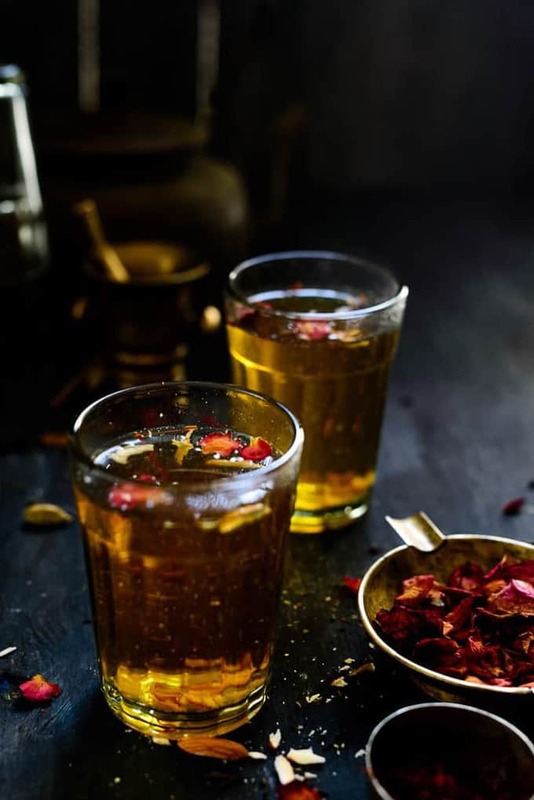 Step By step Authentic Kashmiri Tea Kahwa Recipe or Kashmiri Tea recipe which is a traditional Kashmiri tea flavored with various spices. Switch off the heat and add green tea in the water. Let the tea steep for a minute. Strain the kahwa in 2 cups. Add almond slivers and a few strands of saffron. Hi! 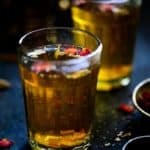 Where can one source the Kashmiri tea from in bangalore? Thanks! Try ordering it online. I ordered mine through Amazon. Oh God! By merely judging the presentation of this beverage, it already reminded me of the romantic dinner dates with my husband! I just hope it tastes good. Thnx Guisela. You must try this once. We loved it.